How the Concheros—the pre-Hispanic-style Dancers of Mexico–and all the movement, color, and joyous sounds they bring with them, rekindled remembered joy in a depressed heart. When you live where every day is a holiday of some kind—an excuse for a fiesta always at hand—it’s easy to forget one. That day I had forgotten. But Mexico has a way of reminding us. I’d had a bad night, full of dark images and lonely threats and deceptive might-have-beens. Still living the aftershocks of a destroyed 25-year marriage, financial worries, aging, and the accumulated weight of depression, I had no smiles left. Walking blindly across the cobblestones, I trudged up one of the many hills that make up San Miguel de Allende, moving toward the Jardín, that central plaza that is the very heart of the town and functions as everyone’s public living room. My mind wandered too, dreading some errand to be run, some friend to be called, some smiles to be summoned up on demand from a well that seemed drained dry. Sore of feet and blue of spirits, all I really wanted to do was go back home and crawl into bed. But there was little food in the house, the library book was overdue, and finances urgently required a stop at the bank. Lost in my thoughts, I saw but did not register the young woman dressed in the standard conchero costume of neon lamé and huge red and green feathers on her head as she passed me going down the hill in the sun. The pounding of the concheros drumming vibrated up through my sandals. The first thing to get past my funk was the vibrations. The thrumming rhythm of drums had penetrated the paving stones, crept down the hill and wriggled straight up through the soles of my sandals. Had I been paying more attention, I would have heard them before I felt them; their pounding was strong, deep, relentless. A reminder. After years of living in San Miguel de Allende, I’d forgotten to check the calendar. It was the first Friday in March, one of my favorite feast days in a city that has more than its share and one of the best times to visit San Miguel de Allende. The day honors Our Lord of the Conquest and celebrates the arrival of Catholicism in Mexico. It is a day when many Mexicans honor the twin traditions of their indigenous roots and their deeply held faith in their Christ and their God. 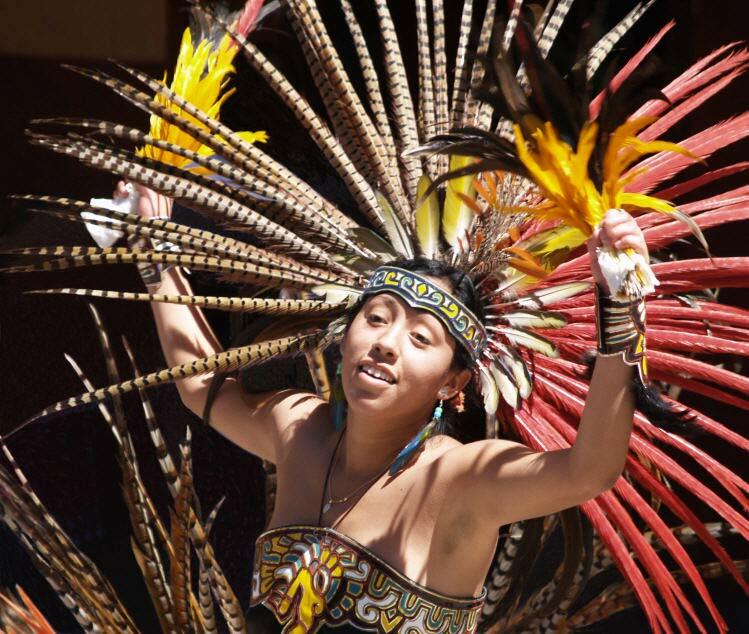 Here in San Miguel, a magical colonial pueblo perched on the high plain of central Mexico, it is also called the day of the Concheros, dancers named for the “conchas”—shell-like seed pods—wrapped around their ankles to rattle as they dance, spin and stomp, jump and leap, mimicking the Aztec dancers of Mexico’s glorious past. A robust mix of pagan and Catholic, this show of their devotion is a highlight of the year. Every year on this day, they fill the Jardín with their fervor, color, movement. And sound. Lots of sound. 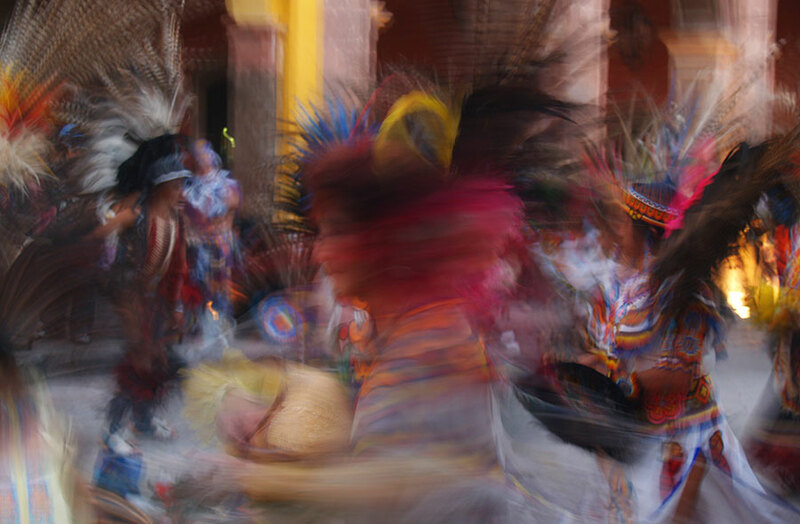 The conchero dancers of San Miguel de Allende are a blur of movement engulfed in color and sound. I emerged from the narrow street into the wide space in front of La Parroquia church. Its pink cantera stone spires glowed and shimmered in the spring sunshine, that elusive light that draws so many artists to San Miguel. 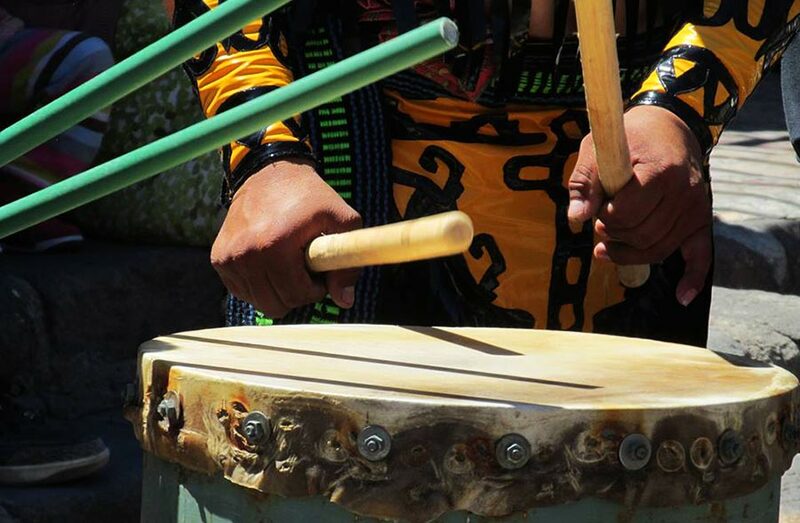 A wave of sound—no, make that noise—almost knocked me over as the pounding of the concheros’ drums rolled over me. I felt assaulted by sound, color, movement. Settling onto a wrought-iron bench beneath the trimmed laurel trees, I let the exuberance take me. The concheros’ flashy pseudo-Aztec costumes, heavy with Pre-Hispanic symbols, neon-colored lamé and fringe, and their two-meter long pheasant plume headdresses, undulated across the plaza, riding the wave of the drumming beat. 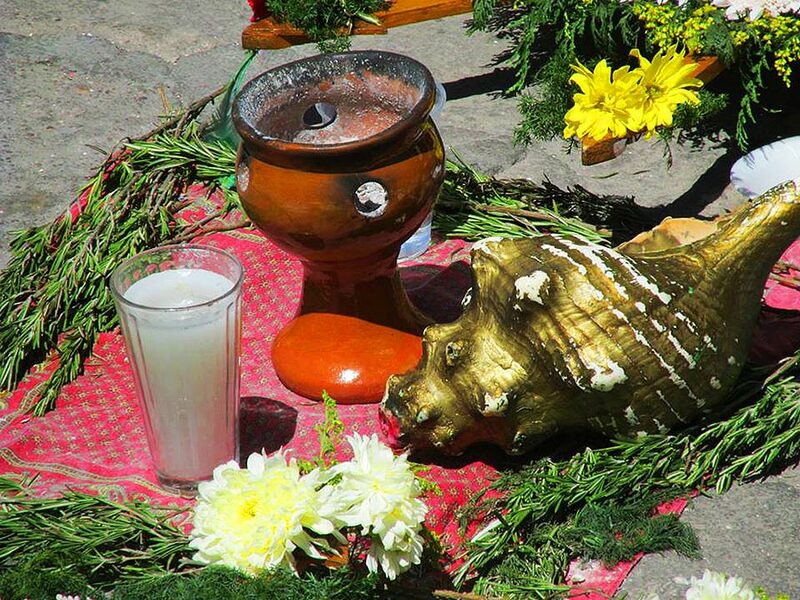 From the center of their circle, the pungent bite of copal incense pricked my nose, wafting up from a pottery burner set beside a mandolin made from an armadillo shell, a conch shell, fragrant herbs and a portrait of the Virgin of Guadalupe. A low mournful note sounded as a senior conchero lifted the giant conch shell to his lips. All around the Jardín, the celebration pulsed. Three separate groups of concheros twirled, jumped and lunged on the three sides of the square. No group danced or drummed in time with the others. The un-synched roar attacked from all sides. The dancers and drummers were not alone in their push to summon the gods of music and joy. In the pretty kiosk centering the square, the town band played. A brassy Souza march rolled across the cobblestones, the notes slightly off-key but the oompah strong and enthusiastic. The tuba player looked to be at least 70 years old. The young drummer might have been his great-grandson. In Mexico, no reason for a fiesta goes to waste, so preparations were being made to continue the concheros’ party well into the night, but to a different beat. In front of the church, a wooden stage waited for more festivities. A rock band sound-checked equipment to make sure it was sufficiently deafening. Then a guitarist launched into a ragged rehearsal, a weird counterpoint to the traditionally beloved oompah blaring a few meters away in the kiosk. From the southwest, clouds of black, boat-tailed grackles rolled into the square to settle into the branches of the laurel trees where they roosted for the night. It always took them a while to settle in as they discussed their day, squabbling over favorite perches perhaps or crowing over fattest-worm bragging rights. Their raucous cawing rained down like sharp pebbles onto the paving stones. I closed my eyes, feeling pleasantly assaulted by the noise surrounding me. It rolled up from all sides, like a big cushion determined to block out all thought, all pain, all sensation of anything but itself. And then the bells began. The huge bronze bells of La Parroquia poured down their peals like waves from the high faux-Gothic spires. They were almost—but not quite—in sync with the throbbing drums, the concheros’ rattling seedpod anklets, the conch shell’s moan, the off-key Souza march, the wailing rock guitar and the grackles’ cackles. The black mood that had engulfed me an hour earlier was fighting for dominance. And losing. The feeling of that heavy cloud of despair lifting from my shoulders was almost palpable, carried off on the enormous wave of sound and dissipated into the brilliant San Miguel light. My eyes, my ears, my whole being swept around the square and took in the scene—the color, the movement, the vibrations… the SOUND. And with a smile of pure joy, a heart light and clear, I thought… finally, I know what a joyful noise really sounds like. It sounds like San Miguel de Allende on the first Friday in March. 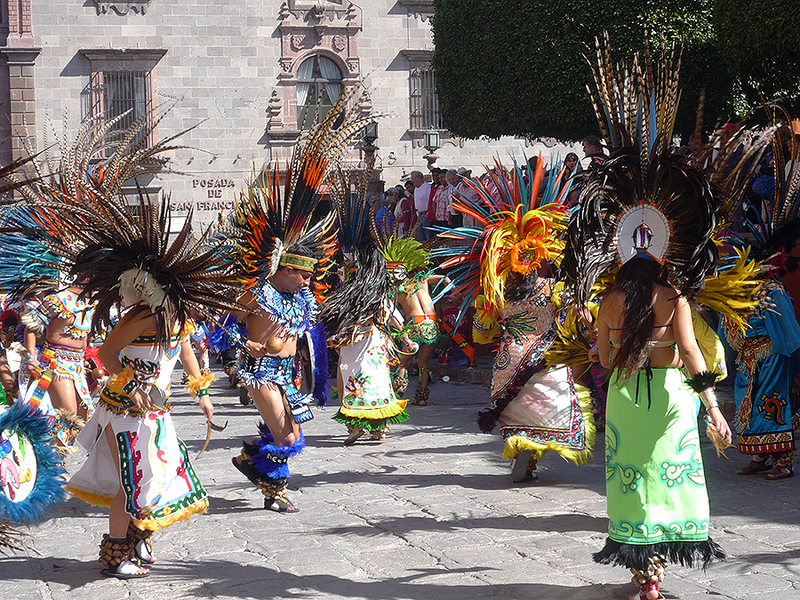 In San Miguel de Allende, the Conchero Dancers perform for Dia de La Conquista every year on the first Friday in March in the plaza in front of La Parroquia church. The dancing begins around mid-morning and continues throughout the day and often into the evening. Photographing the dancers is allowed. San Miguel de Allende lies in the central highlands of Mexico. By car, it is nine hours south of Laredo, Texas, on highway 57. The nearest airport is Bajio International Airport (BJX) located in Silao, about an hour from San Miguel. International flights also fly into Mexico City, about 4 hours from San Miguel by bus or private shuttle. For more information about visiting San Miguel de Allende, visit Experience San Miguel de Allende. When we most need it, the Universe will provide the reminder. In this case, you needed it vividly and we get to read and see the treat. What a great reminder to celebrate each day with joy. So true, Betsy. Each day, every day, we need to remember to celebrate. Thanks for the comment. Beautiful article. I’d love to go there someday! Thanks Liz. San Miguel is definitely worth a visit at any time. What synchronicity to have Conchero dancers appear on the scene just when you needed them! Even better, that you seized the opportunity to dive in and lose yourself in the cacophony of such a superb moment. Beautifully told, Donna! Thanks Anita. Yes, it was one of those magical moments the Universe just seems to hand us sometimes… when we need them most. And thanks for your input on the post at TBEX! San Miguel is always a pleasure. I’d love to someday be there for the day of the Concheros. BTW, I saw these dancers somewhere else and they were wearing butterfly cocoons instead of seed pods wrapped around their ankles to rattle as they dance. Hey Donna, How wonderful that the festivities cut through to you, and that you were able to set the daily doldrums aside to celebrate. 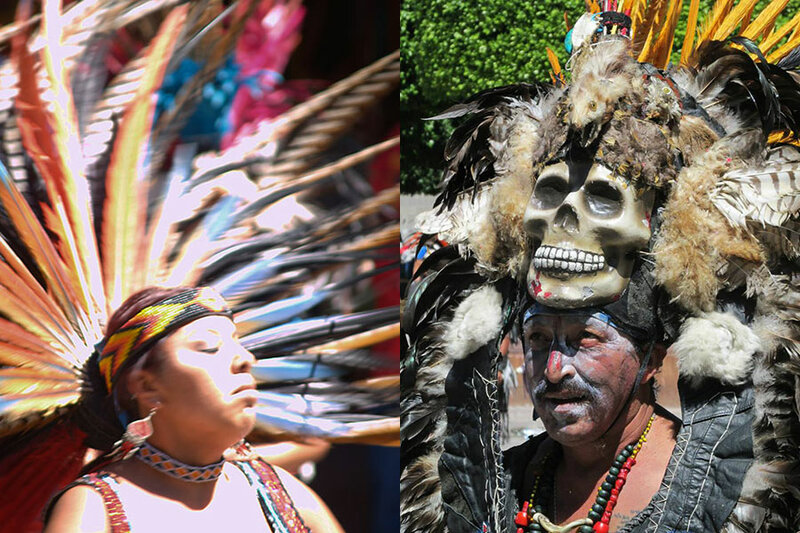 Your photos here are really nice, and I can practically hear the beat of the music from San Miguel de Allende. Thank you, Kris. I’m especially glad you liked the photos. It is the most photogenic festival! It’s just impossible to stop clicking the shutter! How fortunate you are to live in such a beautiful place that can buoy your spirits! 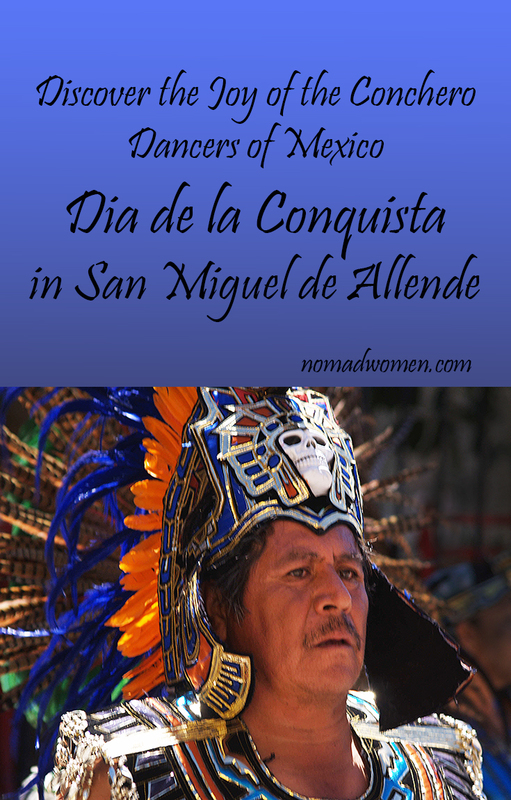 We have been to San Miguel de Allende during a festival but admittedly, not as beautiful as this one with the Conchero Dancers! Thanks Irene. Yes, I do realize how fortunate I am. I feel like I live in paradise. 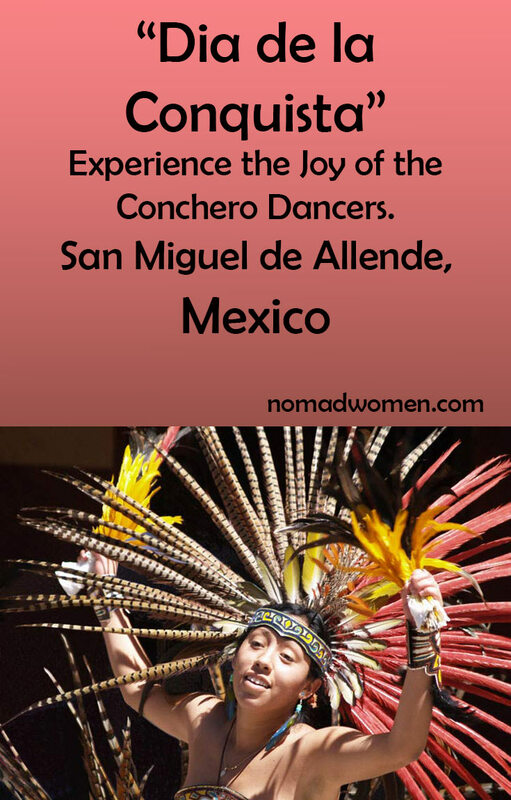 I’d love to see the Conchero Dancero Dancer of San Miguel de Allende. Our second day in San Miguel was a feast day and we were awakened at 6am by fireworks which went on for hours. They sure know how to celebrate! Your brave and strong spirit were a good match for the power of these dancers. I’ve witnessed several dancing rituals at Teotihuacan but never been inside the ceremony as you were. How fortunate. How delightful for the universe to provide an unexpected joyful noise when you most needed it. The Conchero dancers are so colourful – they have to lift spirits. I love your pics of the colorful Mayan costumes. We saw one of their traditional dances in Playa del Carmen, where they have them pretty much every night. Your descriptions of the celebration had me feeling like I was right there with you. Sam Miguel de Allende is high on my list of places to visit. Beautifully written article. The celebration seems a feast for the senses, and so glad it pulled you out of your funk.Life may change, but it goes on. We somehow manage to get through hard time and survive, even thrive. Except for the rock band, I remember the sights and sounds you describe from watching these festivities in San Miguel de Allende as a 9 year old, some 52 years ago! Your photos of the concheros are wonderful and remind me of some taken by a photographer friend of my father’s lo those many years ago. I especially like the blurred photo in your post. It perfectly captures the “feeling” of the conchero dancers. Thanks Suzanne. I love comparing my images of San Miguel with your memories from so long ago. Hope you will get to see it again soon. I love your pictures, so colorful and vivid. Pleasure reading your blog. I’ve added it to my reading list. Thanks so much for letting me know that, JC. I’ve just been checking out your blog too. Nice work! San Miguel is a delightful city – how fortunate you live there! It’s so artistic and colorful, and no doubt inspires some of your writing (which is really good, by the way!). Thank you so much for that lovely comment! Made my day! And yes, it is pretty hard not to be inspired by San Miguel. I know how fortunate I am to live here. Love your narrative and images are amazing. Thanks so much for this journey and glimpse into your soul. Very moving. Thank you so much, Vi. I appreciate your comment. Thanks so much for writing this post. Sometimes, we see what we need to see in that moment to help us through life and living. As one commenter’s said, very moving. Awesome post.The pictures are just fantastic. This sounds beautiful in so many ways. It’s amazing how transformative a festivity like this can be for our mood. The way the feeling of the passion of people or a group of people in music and movement can just dive into every corner of your being. Wonderful, so happy this fiesta was there to rejuvenate you! Thank you for sharing! What a beautiful post. Your story touched me and I’m so glad this fiesta lifted you when you need it so. Thanks for your kind comment, Tania. It was a wonderful moment for me.